Best Audio Baby Monitor Buying Guide - Which? How much a Best Buy audio baby monitor will cost you, and the extra features it's worth splashing out on. Audio-only baby monitors range from the very basic mains-powered to feature-rich battery-powered units. These baby monitors don't come with a fancy screen, so you won't be able to watch your baby, but if you get a decent audio monitor with clear sound and accurate lights then you can still have piece of mind while your baby sleeps. Find out which audio baby monitors came out best when we tested them in our baby monitors reviews. The key decisions about what model to go for will come down to what features are most important to you. If you're considering buying a video baby monitor, make sure you check out our separate guide on how to buy the best video baby monitor. Should I buy an audio monitor? An audio baby monitor is considered an essential piece of kit by many parents. In our latest survey of what parents considered the most useful baby products, an audio monitor was second on the list. If you want extra piece of mind while your baby sleeps without splashing out too much, an audio baby monitor is a good choice. But make sure you choose one with clear sound so that you can easily tell if your baby is happily gurgling to his or herself or needs your attention. You should also choose a model with accurate, sound-sensitive lights, so it's easy to spot whether your baby needs you at times when you have to have the monitor sound switched down. How much does an audio baby monitor cost? Audio monitors are much cheaper than video baby monitors, and can start from less than £20 for a basic model, up to more than £100. For £20, you'll get a basic baby monitor without any bells and whistles, but it will come with sound-sensitive lights and maybe an out-of-range alarm or a two-way talk feature (where you can talk back to your baby). If you're willing to splash out a bit more, you can opt for a top-of-the-range audio monitor packed with features such as a temperature monitor, a night light, lullabies, two-way talk and the facility to control some of these from the parent unit. Spending more doesn't guarantee you'll get crystal-clear sound or accurate sound-sensitive lights though, but we've found Best Buy audio-only baby monitors for as little as £35. See the best baby monitors – we test the key baby monitor features to find out whether they're really worth it. Not a Which? member? Join Which? today to access our baby monitor reviews and thousands of other independent reviews of products we've tested. All baby monitors consist of a baby unit – also known as the nursery unit, as this part stays in the nursery. 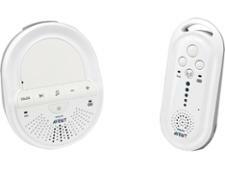 This transmits sound via radio waves to a parent unit – the part of the baby monitor that stays with you. Mains-powered baby monitors are the simplest and cheapest type available. They need a plug socket to work, making them less portable than other options. Prices start at around £15 for a basic model. You can also buy battery-powered baby monitors – dual-powered devices that allow you to swap between mains power and batteries. This type of monitor allows you to carry the parent unit around the house with you, or to plug it in when you're staying in one room. Prices start at around £25 for a basic model, going up to more than £100 for extra features including night lights and digital sound. Most have rechargeable batteries so you won’t need an endless stock of batteries to avoid running out. Rechargeable baby monitors are usually at the pricier end of the scale. The features you’ll find most useful will depend on how you will be using your monitor, but here's the ultimate wish list of those you could consider. Just want to see the best baby monitors we've tested? Browse our baby monitor Best Buys. Range A decent range is important if you want to be able to move about your house without losing signal. Our tests check that a baby monitor’s range fully covers different property sizes and types, crucial for its effectiveness. Don't always believe what you read on the box. Sound-sensitive lights These are really useful if you want to have the sound down, when you're having dinner or watching TV, for example. Accurate lights mean you'll be able to tell when your baby really needs you so you don't leave him or her crying. Battery life A decent battery life on the parent unit is a must. You don't want to be having to charge your unit every hour to make it last, or having to sit by a plug socket to use your monitor. Our tests record how long the batteries will last before they need recharging or changing. 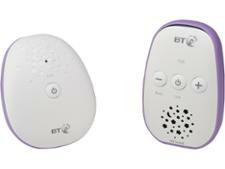 DECT or digital A digitally enhanced, cordless telecommunications (DECT) baby monitor has a microprocessor designed to ensure the only nursery sounds you can hear are those from your own nursery, not anyone else's. It also means interference is minimal. Night light A light on the baby unit can be very useful for a child afraid of the dark or for you when you have to tend to your child in the middle of the night. Some parent units also feature a torch. Talk-back communication This works like a walkie-talkie and lets you reassure your baby through the monitor without having to go back into the room. It's called two-way talk on some monitors. Room temperature display Some parents find this useful and appreciate the alerts that the monitor can give when temperature falls below or rises above the recommended range (between 16 and 20°C). Lullabies A useful additional feature – playing lullabies to help soothe your little one to sleep. Be warned though, the music can get irritating. Portable parent unit If you are going to be moving around the house regularly, it’s worth spending extra on a battery-powered parent unit that’s easily portable. It’s also worth making sure the parent unit takes rechargeable batteries.